Before Thailand existed there was the Kingdom of Ayutthaya known in foreign lands as Siam. 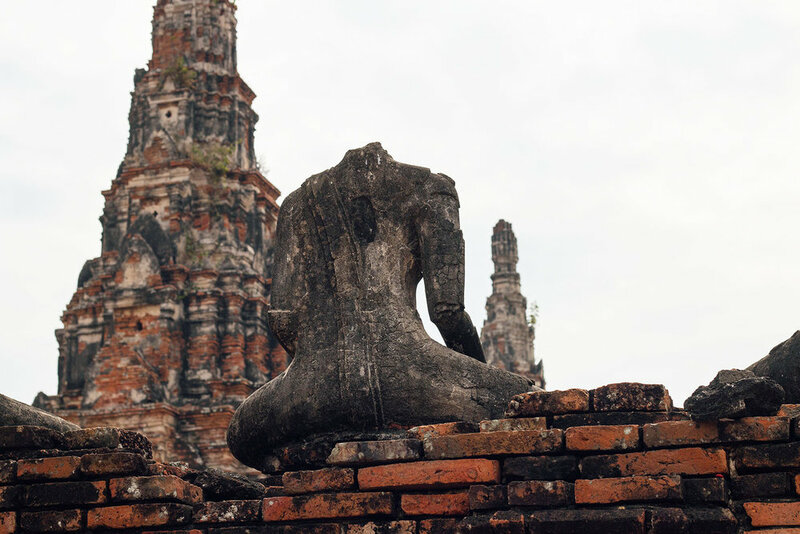 The seat of this kingdoms power was a city named Ayutthaya. However in 1767 this city was destroyed by the Burmese causing an end to the kingdom and sowing the seeds for modern day Thailand. When we ventured to this ancient city by train we rode in the cramped 3rd class car. Despite how crowded the train was vendors still managed to squeeze through with offerings of fruit, juice, and stir fry. Some basil rice and pork quieted my hungry stomach. When we arrived in the city, tour guides waited outside the train station to take you to the historical park. I had assumed the ruins of Ayutthaya was concentrated in one large place, instead it was spread out across 13 different sites. In order to make the evening train back we only had enough time to see 3 of them. We bartered with a tuk tuk driver to take us around and then we were off. When we arrived at the first Wat, rain threatened to ruin our day, however it was light enough that we didn’t have to run for cover. The first thing that stood out to me was the color of the brick, it was a warm red that stood out against the rainy overcast sky. I loved seeing the way time has affected different parts of the grounds. For examples some of the statues were worn away to nothing but the feet whereas others had whole torso’s still attached. I wondered what this place might have looked like in its former glory. The rain eventually vanished and the sun came out to join us as we made our way to the second wat. The second temple we went to was a lot more spread out with huge buildings organized around a central area. Whereas the first grounds we went to were super crowded these mostly empty except for structures so tall that you felt small by comparison. I imagine the priests who walked up those large steps must have had thighs of steel. The third temple was similar to the second but we didn’t get much time to explore since we had to make it back for the evening train to Bangkok. When you are busy photographing time just evaporates. We sat in the station eating sticky rice and grilled meats happy with our successful outing as we waited for the train to arrive.